James Franklin thought he had the redshirt freshman receiver from Pontiac, Mich., all figured out. But the Penn State head coach didn’t. Not totally. He knew the 5-foot-9, 173-pounder was a two-year letterman at Orchard St. Mary’s, the alma mater of Nittany Lion superstar Allen Robinson before transferring to the IMG Academy in 2016 for his senior season. And Franklin knew that even after Hamler tore his ACL, MCL and meniscus that Penn State still wanted him. Hamler came to Penn State in January 2017 and sat out last season. And after watching Hamler rehab and seeing his performances in practice and scrimmages punctuated with an infectious upbeat attitude and confidence/cockiness (he wears No. 1, after all), Franklin continued to know all about Hamler. And believe in him. 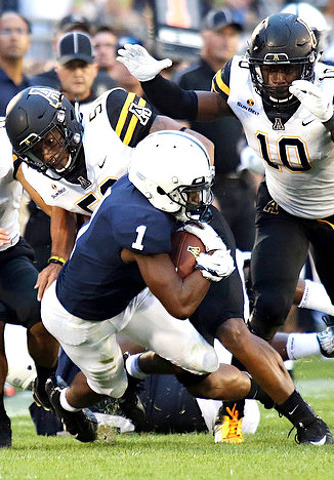 So much so, in fact, that Franklin installed Hamler as a starting wide receiver— alongside seasoned vets DeAndre Thompkins and Juwan Johnson — vs. App State, even though it was Hamler’s first real, live game since being injured at the very start of the 2016 season. 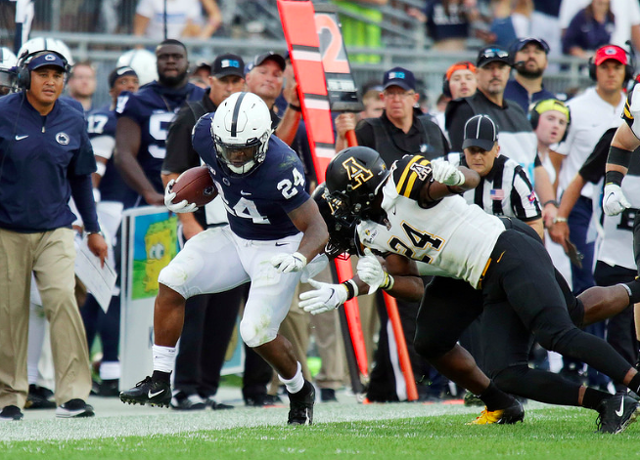 “We got a lot of belief in KJ and have for a long time,” Franklin said after Penn State defeated Appalachian State, 45-38, in overtime Saturday in Beaver Stadium. The Hamler that Franklin saw in the first half against App State was not the KJ that CJF thought he knew. Quarterback Trace McSorley threw three passes to Hamler in the game’s first 30 minutes, completing two — for 6 yards and 1 yard. Hamler also fielded three kickoffs in the first half, all deep in the Penn State end zone, all of them touchbacks. Hamler was quiet on the stat sheet, on the field and on the sidelines. Franklin knew something was wrong. Not too much later, Hamler, as we know, had a fourth quarter for the ages. He had 113 yards of total offense in a span of 11 minutes. A deep route where Hamler laid out all 69 of his inches in horizontal fashion went for 46 yards and led to a touchdown. His late-game 52-yard kickoff return that began with a clash of wills in the student section end zone — “Should I stay or should I go?” And his 15-yard TD catch of a McSorley rocket that, with the PAT, tied the game at 38-38 with 42 seconds remaining (watch it below). Did Franklin kickstart KJ? Or was it just a matter of time, of circumstance, of potential finally meeting possibilities for Hamler? KJ Hamler, who confidently knows Kahlee Jacoby Hamler — and both his arduous road back from injury and his love of a football life — says it did not. The head coach knows that now. It’s impossible to spell “charisma” without most of the letters in “Hamler.” His appeal is strong, his confidence natural, his self-assurance borne not of his success as a high school star or his natural abilities. Rather it is the creation and the culmination of an 18-month journey back from some very serious injuries. “How did you know?” Hamler was asked. You never had a doubt? So yes, KJ Hamler knew. And on Saturday night, so did everyone else. If Miles Sanders was trying to make people forget about Saquon Barkley he probably shouldn't have jumped over a defender on his very first carry of the game. And Sanders had to jump, and he did, picking up two-yards in the process, and reminding everyone of the guy he would rather not remind everyone of.